As the saying goes “it takes a village to raise a child”. What is the translation of that saying for the older adult that needs a similar level of care and attention? Who and where is the village? For the Wyngate at Circleville, the “village” is not confined to the property lines or within the walls of the buildings. The Wyngate extends to the surrounding community enriching the lives of Wyngate residents, their friends, family, and neighbors. This community vision was at the forefront of the design and doesn’t stop there. The Wyngate partnered with Berger Health, the community hospital, to provide clinical care and physical therapy services in a suite designed specifically to meet the needs of both campus residents and elder patients from the nearby neighborhoods. Stacy Stoll, Director of Marketing, Chancellor Health Partners shares: “The Circleville community has whole heartedly welcomed the Wyngate Senior Living Community’s design, vision, and purpose of being more than just another senior living community”. She goes on to say “we wanted to be sure that this was not just a great place for the residents, but also a place that their family wants to come spend the day visiting with their mom or dad, grandma or grandpa”. 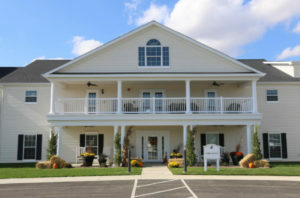 The Wyngate Village at Circleville is located on a 10 acre campus featuring a single story 50 private room assisted living facility as well as a two story 28 unit independent living building located in close proximity of one another. Each features a large front porch and rear patio gathering space. They also share outdoor amenities such as a fishing pier, butterfly garden, a pumpkin patch!, orchards, “Victory” gardens, pavilion, wild flower gardens and shuffleboard court, all interconnected by safe walking paths. As designed, these interactive spaces extend into the interior environment. Activity destinations support and encourage social interactions. Each home features a large dining room with plenty of seating for visiting family and friends. The homes also contain group activity spaces, comfortable living rooms, and intimate gathering nooks near residents’ private quarters. Chancellor Health Partner owns and operates fifteen senior housing communities located in smaller cities in Ohio and West Virginia. They have been a client of Andrews Architects for twenty years.